I personally love Voss Water because of its glass bottles and the fact that the water comes from Norway is not a bad deal either. I never thought much of buying water, I figured it all taste the same, but I was very wrong. I had bought the Voss Water because I wanted the bottle for a project so of course I am gonna drink the water not just dump it, so good, from here I was a Voss Water lover. excited I was to hear about the new Sparkling Flavored Waters from Voss. We tried three flavors, which are: Lime Mint, Lemon Cucumber and Tangerine Lemongrass. I would definitely say my favorite is the Lime Mint The flavors in these is not really strong, it still tastes like water, but with a hint of the flavor, which is what I enjoy because other sparkling flavored waters are a bit too much. The kids also had a chance to try the new Sparkling Voss Water as well and also enjoyed, so now I can get them to drink more water. 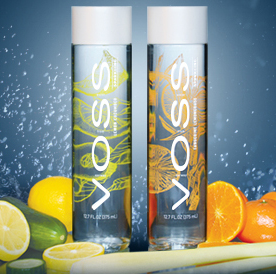 You can purchase the new Voss Sparkling Flavored Waters at Whole Foods and other retailers.